I actually finished this project back in whenever it was I posted the previous post. Just FYI. But I keep getting all this traffic on those posts, so I figure I owe it to humanity to talk about the finished product here. Here, I think, is how this wrapped up. 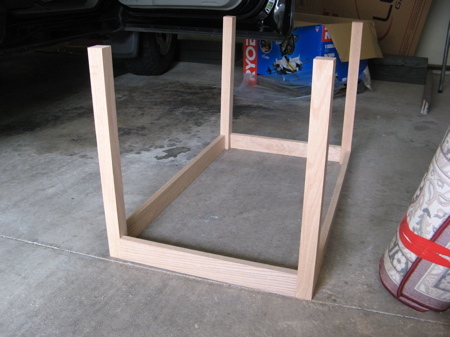 So next up was getting the two shelves glued together. I couldn't find good boards anywhere, so I just bought what they had at Lowe's. I know, that kills the romance and all the advice about choosing good wood. FWIW, the shelves aren't nearly as visible as the top or even the legs necessarily (but probably), so... yeah. Glued the shelves in the same manner as the top, except that I cut the shelves 1.5 inches shorter than the top in order for them not to stick out past the legs on either side of the TV stand (and for some reason I thought it would be cool if they *did* stick out past the front of the stand). As per usual, left these two shelves to dry overnight. Which then brought me to using my new second-favorite tool, my belt sander. Louder than heck and my neighbors ended up complaining to the homeowners' association over it, but still: this tool really does its job. Clamping the top down to the TV stand frame itself was a little ghetto, but this was the one case where using my truck's tailgate as a workbench just didn't work out. 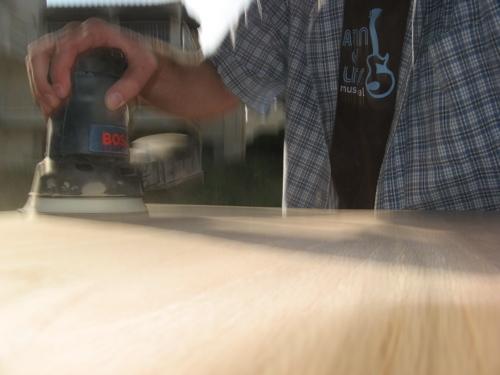 Per something I read somewhere, I did the heavy sanding against the grain, then the finer sanding *with* the grain. While this seemed to sand out the rough spots faster, getting the cross-hatches smoothed back out of the boards seemed way harder than it should have. Advice: just go with the grain. And FWIW, the sawdust spray out of this thing was terrific. Had to do that on all four corners of both shelves. It was awkward keeping these cuts straight and in retrospect, short of buying a table-saw, I probably should've made these cuts with the compound miter saw prior to ever gluing the boards together. Ah, bittersweet hindsight. From this point, I used some fine grain paper to sand the corners smooth, then wrestled with the entire frame, shelves, and table-top in order to make sure they'd fit together. 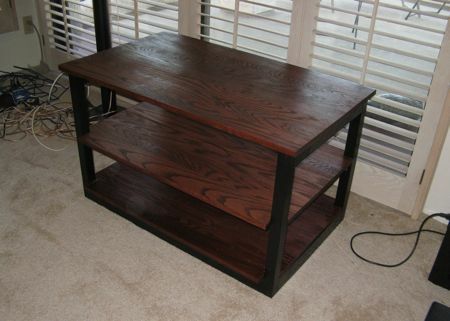 I used the same paint scheme that I had with my earlier writing table -- high gloss black (only one coat to allow for an almost-see-through-but-not-quite quality) on the legs and red oak stain for the shelves. The staining went well -- rather than use the brush, I applied the stain with an available rag, which seemed to cut down on the bubbling. And if you've never stained before, the most crucial part is ensuring that, after the requisite waiting period (15 minutes? can't remember -- it's on the can), you wipe off all the remaining stain in its entirety, as much as you can possibly wipe off of there. That's sort of what makes it stain rather than paint. Once everything was painted and dried, I dragged all the parts from the garage, across the parking lot, and into my domicile for final assembly. The bottom shelf rests on the "skirt" that was originally built into the frame, so that sent down no big deal. For the middle shelf, though, I opted for brass angle brackets to hold it up. As you can see, I got pretty lazy with the stain and only did one side of each shelf component. Trust me, I haven't looked up at the bottom of these shelves since installing the TV stand in my living room. If you look closely, you can also see where using the hand-held jigsaw wasn't the best way to go (the one cut on this corner went a little too far -- and this wasn't the worst of these corners). Things I'd do differently? Aside from the jigsaw thing -- and I really like my jigsaw, so I feel bad about calling it the wrong tool for the job (even though it was), after living with the finished product for a couple months -- I probably should've placed the middle shelf another inch or so higher -- my center channel has way too much clearance. I'm thinking about creating a Corner Entertainment Center for my other living room and make it slightly bigger than needed so that I can organise everything better and have extra space! Also, it might've been good to have made the entire thing another two inches wider -- the components on the bottom shelf are partially obscured by the legs of the frame, which doesn't really hurt anything, but just seems a little off ideal. So that's it. Good luck to us all. With that, then, it’s time to get going on building the framework. 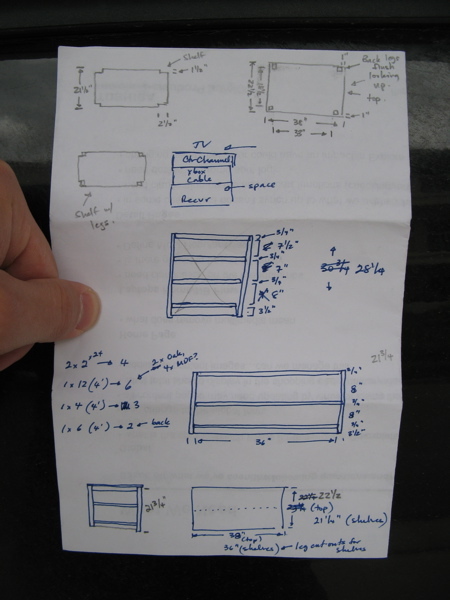 The vertical supports of this TV stand come in the form of four 2×2 boards. To these, I’m going to attach an apron that goes along the bottom of the TV stand, and then another, uh, apron that goes along the top (but not along the top-front). They should both help stabilize the beast, plus the bottom apron is going to be the support for the bottom shelf and the top apron is going to give me something to attach the top of the TV stand onto. The pieces are all cut already. Also, I had to buy more wood since I neglected to buy what I needed for the top apron. This required an additional 4-foot long 1×3 and two more 2-foot long 1x3s. And in case you’re wondering, buying the two 2-footers was cheaper than buying one more 4-footer. I blame Bush. 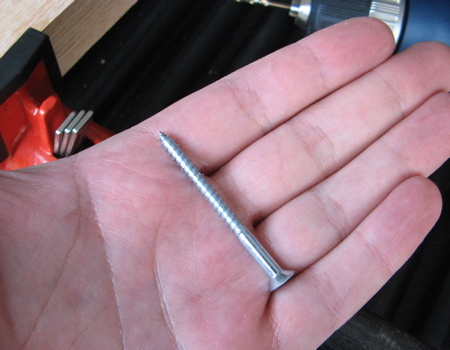 These are 2-inch #8 wood screws. I recommend you buy Torx wood screws, they need to be two inches since they have to get through 1 1/2 inches of the 2×2 uprights and then still have a little bit of hold in the 1x3s thereafter. The screw diameter (#8) is based on the largest diameter that I thought wouldn’t split the 1x3s (so far, so good). Getting these screws in requires some thinking about what you’re doing. If you look at that screw up above there, you see how the screw gets wider at its head? This red oak I’m using does *not* accommodate that extra girth at the head. If you try to screw harder to get the thing flush with the wood, the screw will break and you’ll know which side of the TV stand is going to be facing the wall (which is kind of comforting to know, in a way). I’m only putting one screw in per upright-board combination. I’m assuming the glue will do *something* here and I don’t want to press my luck drilling into the skinny end of the 1x3s too many times — they’re only 3/4-inch thick and the #8 screws don’t leave much clearance on either side. For the long sides of the bottom apron, it turned out that my 36-inch lengths of pipe weren’t long enough (the long side of the bottom apron is 36 inches itself). 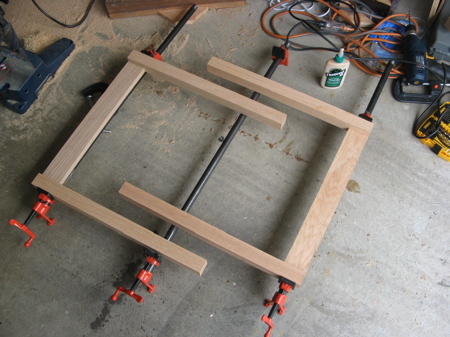 So I had to go out and get a big-enough quick-grip clamp and use that to aid in the gluing for the long sides. 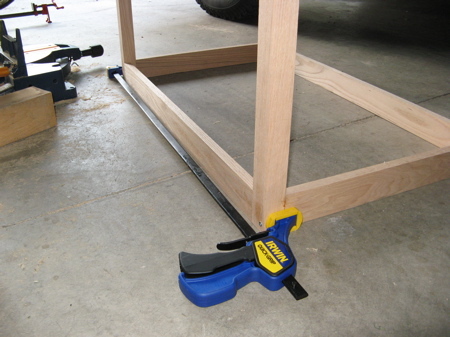 The quick-grip clamps are pretty handy. They don’t take much work to use, they don’t have to be on the ground to work, and while they’re a little expensive (I think the three-footer was $35 or so), they… I dunno. They’re a little expensive. Between them and the pipe clamps, I have to think that the pipe clamps deliver more pressure. I could be way off on that, but for me it feels better to be able to tighten the clamp myself by rotating the pipe clamp handle than it does to push on this plastic trigger and *assume* it’s doing something. 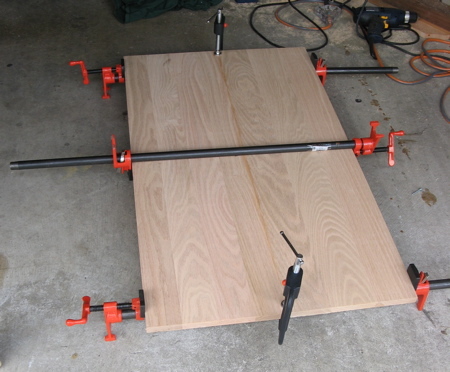 But so far, the quick-grip clamped gluings have done as well as the pipe clamp clamped situations. When my TV falls through the stand, though, you’ll know which one I’m going to blame. So close. So close. Not really. 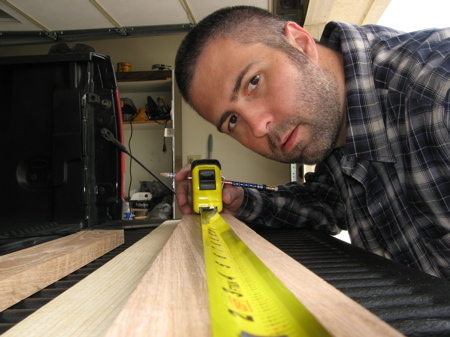 Bad news at the hardware store today, though — they’re out of stock on the 4-foot 1x12s I need to build the two shelves. I’ll check back later in the week, but those shelves need serious 24-hour clamping times and are thus long-lead items (especially given that I only have three pipe clamps and will have to do one shelf at a time). But hopefully the trucks start rolling in tomorrow (to Lowe’s and nowhere else — I hate getting stuck behind ’em) and I can pick up my new favorite boards during the week so they can be glued by the weekend and I can get to sanding, painting, and final assembly. Maybe. My favorite part of doing this kind of project is using the compound miter saw. That makes it all worthwhile. Everything else just seems like work by comparison. I measured and cut the top. I’m planning on having the top overhang the legs of the TV stand by an inch except for at the back (where it’ll be as flush as my orbital sander can make it). Somehow that seemed relevant to mention. The only issue with cutting these boards is that my compound miter saw is a 10-inch saw and these boards are 12 inches wide — so I had to flip the boards over again and in effect make a couple cuts. It actually wasn’t hard to get the second cut to line up straight with the first. I just put a nice, even, stripe of glue onto one of the boards. Once glue was applied, I went ahead and but both boards together on top of the pipe clamps and gave a couple turns on the clamps to keep the boards together, but loose enough to adjust. If you’ve never used pipe clamps before, they’re sort of cool. Like I’ve mentioned, I’m kind of a n00b, so the first time I went to try and buy these, it was a little confusing: the clamps are sold separate from the pipe. After about 20 minutes of stewing on this issue at Lowe’s, I *did* figure it out. And the pipe is just pipe. With the boards gently squeezed, no doubt some glue will have already seeped out between the cracks. You have to wipe this off (a putty knife is recommended), otherwise you’re setting yourself up for some heinous sanding action later on in the process after the glue hardens and it’s time to stain the top. 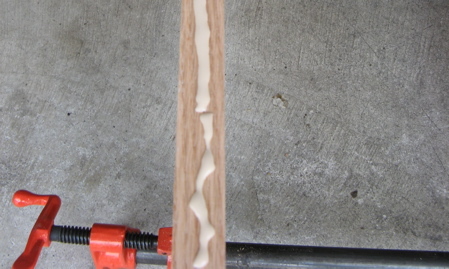 It still seems crazy to me that the glue is strong enough to hold these boards together. 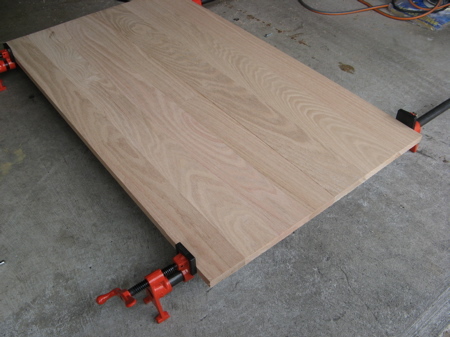 I’m going to leave the boards clamped up for a good 24 hours to give the glue the best chance of success possible. I’m also going to hedge my bets by eventually screwing on a brace underneath to try and keep some of the pressure off the glue. Last thing I need is my TV falling through the TV stand as the top of it breaks apart. All that’s left to do at this point is more cutting, which, as stated, is the best part of the project anyway. Using the compound miter saw feels absolutely primal to me. In a good way. So, I measured out the lengths for a leg, then, primally, sawed it. Again, as mentioned: Best Tool Ever. I’m not sure how people did this kind of cutting before the invention of laser siting, though. Once I had the one leg cut, I used it to cut the other three, i.e., I put the cut one on top of the uncut one, made sure they were flush at the end, then used the cut one as the guide to saw the uncut one in the right place. I’m sure that violates some sort of woodworking protocol, but it seems like a reasonably efficient way to get four legs cut to the same length without being subject to the vagaries of pencil lead. Should also maybe mention that, so long as the legs are all the same length, it’s not all that important that the length be exact. What I mean is, per the plans, these legs are supposed to be 21 3/4 inches long. If they’re off by an eighth of an inch either way, it doesn’t matter — so long as they’re all the same length, no one will ever know to think to consider suspecting (except anyone who’s read this). Legs done, it was time to measure and then cut the bottom apron. Measure, boy, measure. I’m using the tailgate of my pickup as a workbench. It’s sort of a ghetto way to go about things, but on the other hand, it’s pretty easy to put away when I’m done. I’ve thought about building a real workbench, but ultimately that’d mean having to rearrange stuff in the garage, which would mean having to clean the garage. The side apron pieces are meant to connect the front and back legs and measure 18 1/2 inches long. This was sort of a crucial length in that my receiver is 18 inches deep and it’s possible that, depending on what else is on that shelf, part of it may need to reside between the legs. The front and back aprons were 33 inches long — the top is 38 inches, minus two inches for the overhang, minus 1 1/2 inches per leg = 33 inches. That’s why. And the table top is 22 1/2 inches deep because a 1×12 is really only 11 1/4 inches wide. So that’s it. I sort of did a brief sanity check and laid out the pieces of wood next to each other and made sure everything ended up the right length. Note (a) the open truck door where I’m blasting Johnny Cash singing “Jackson” recorded live at Folsom Prison, (b) two giant cardboard boxes in the background, and (c) my oriental rug still taped up from last move, rendered useless by a condo that has carpet everywhere. I suppose you could notice the oil stains too. If you wanted. 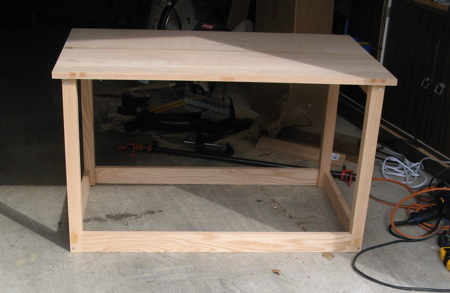 Moving on from the massive success of my, er, *writing table* (which now is mostly used to rest my cell phone on while charging and sometimes hosts piles of junk mail on the way to the recycle bin), I’m building a TV stand. 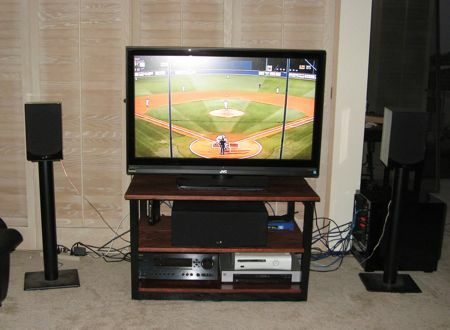 I have looked around and so many corner TV stands, but after much thought, I have made the crazy idea to make my own!! 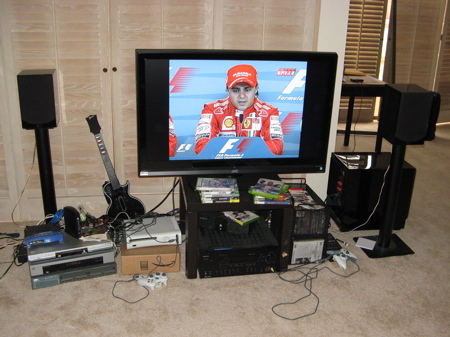 My TV is currently on top of a $20 IKEA end table with all my important Components soaking up dust from the floor. Plus there’s no room for my center channel, so I’m forced to listen to dialog through the front speakers. Very sub-optimal. 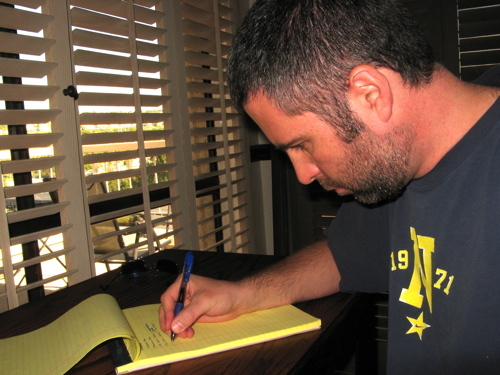 The blue pen drawings were the extent of the original plans. That’s what I used for my first trip to Lowe’s on Wednesday. They were good enough to know what basic first-stop materials I was going to need. They were based primarily on the size of the components (height, width, depth). I’d originally thought of building a tower with one component on each shelf of the tower (check out the middle sketch with the penciled “x” drawn through it). That was going to make it so I’d have to be standing up to watch TV straight-on (i.e., without looking up), so I scrapped that for a version that calls for components to fit side-by-side on a wider stand that’s a more conventional height (most stands in stores are 18 to 24 inches tall). I ended up not buying any wood for the two shelves called for in the plans. The original short list implies MDF (albeit with a question mark), but upon further review that seemed too chintzy. Unfortunately, Lowe’s only had six 4′ 1×12 boards there and didn’t like the looks of half of them — so I gotta go back for more (which is okay, because I don’t have enough equipment to glue more than two boards at a time anyway). Just by the way, the cost for this trip to the store was around $100 — and I still have four more 1x12s to buy at $25 a pop and will probably want to buy some more 1x3s (or 1x2s) to help support the top of the stand. Red oak is kind of expensive and a little hard to work with (in that it’s a pretty hard wood), but I like the way that it looks. The ash (poplar? whatever it is) that Lowe’s always has would probably look nice as well. It’s only a little cheaper and is about as hard (or harder?). It doesn’t have as much “character” as the oak (IMHO), but that can be a good thing. Also: I still need to buy some hardware (2 1/2″ brass screws, corner brackets) and some of the materials (stain, paint, other screws) I just happen to have left over from the writing table. Counting the cost of the hardware, stain, paint, and wood, I’m expecting this table to cost somewhere in the vicinity of $250. I can’t actually guarantee it’ll look any better than something from IKEA, but I’m mostly doing this for fun, so — screw IKEA and damn the cost. Today was Day 1 of the actual building process, but I’ll make that a separate post — eventually. It turns out that, size-wise, the table’s more of a writing table than a kitchen table. The idea that two people could eat at this little guy is almost laughable. Oh well. It’s the size that would fit in the allotted space, so I’ll deal with it. The table isn’t for me anyway: it’s for a HUD home that I bought and am refurnishing to flip for a profit, so I’m not too worried. As big a pain as it was to get screws into, the red oak looks really nice; I like the grain and how heavy the thing is. 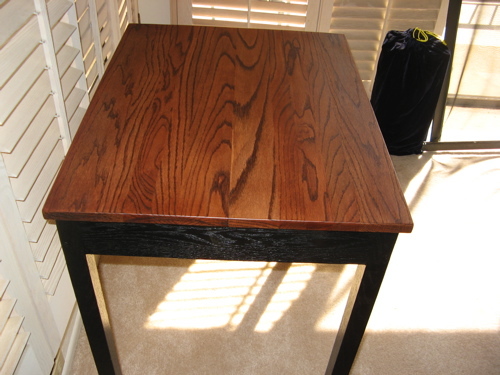 I wasn’t sure about the black paint on the legs, but I like the way it brings the grain out and it ties in pretty well with the rest of my bachelor-quality black furniture. I’m pretty happy with how smooth it is, especially where the two 12-inch boards were glued together for the top. Also happy that it doesn’t wobble — pure luck, but I’ll take it. Next project is probably a work bench. If I get excited at that point, I’ll build an entertainment center maybe. “Entertainment” may be too strong a word — I’ll build something I can put my TV on, my center channel in, and my receiver under. I love writing blog post headlines for the sake of search engine findability. Seems honest. We’ll see where I end up ranking. 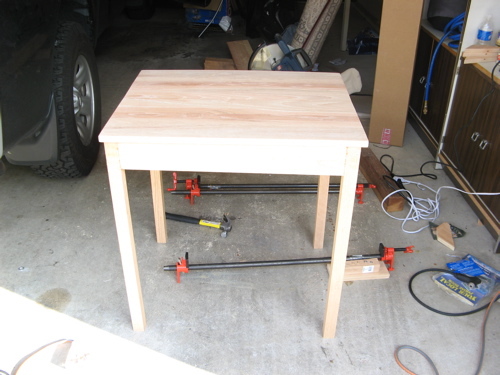 So I’m building my own kitchen table, a *small* one. 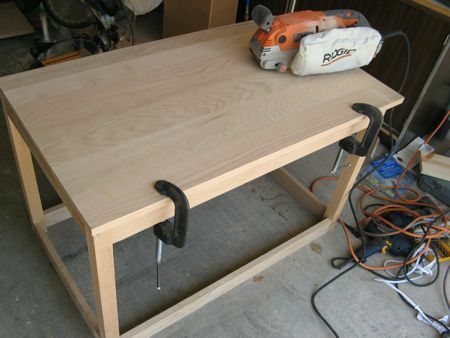 Wood glue alone isn’t strong enough to hold a table together. And good luck trying to get dowels to work. 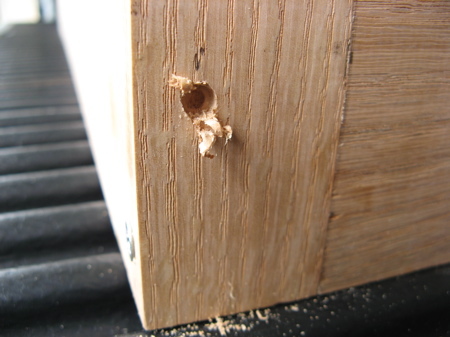 You can’t find 2-inch #8 wood lath screws at Lowes. And screws are pretty difficult to get through hard wood anyway (the table is all oak aside from what will eventually be the tabletop support beams). They don’t call it “hard wood” because it’s so easy to work with. 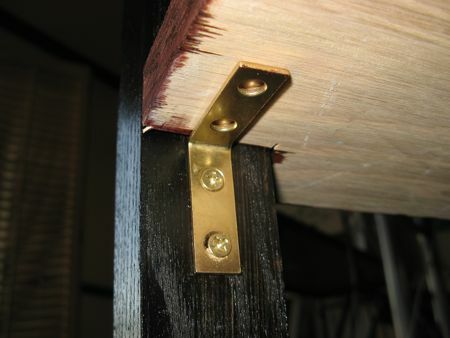 Screws showing on the outside of the table seem a reasonable compromise. 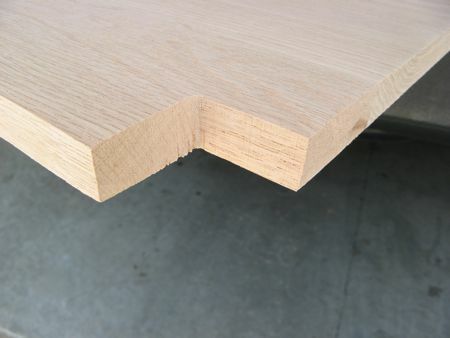 A compound miter saw is a very good thing. 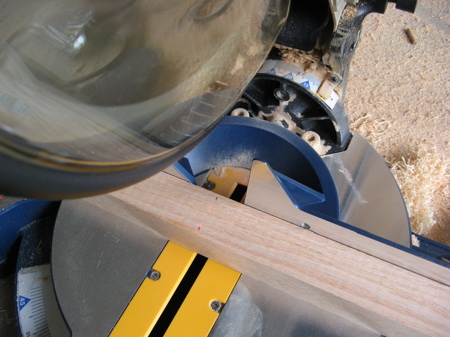 Radial sanders are also good, but not as good as compound miter saws. Just because you found instructions for building something on a website, that doesn’t mean you should follow them (dowels!). Similarly, just because a different approach *seems* like it might be easier, that doesn’t mean you shouldn’t do it that way. A truck tailgate is a pretty serviceable work bench. A new can of stain is too full to stir. Shake before opening. Considering they’re not even electric, pipe clamps are pretty a-okay as well. Buy a 1×4 for the support plates. Sand the legs and base. Paint the legs and base (gloss black). Cut the 1×4 and attach it to the legs and base. 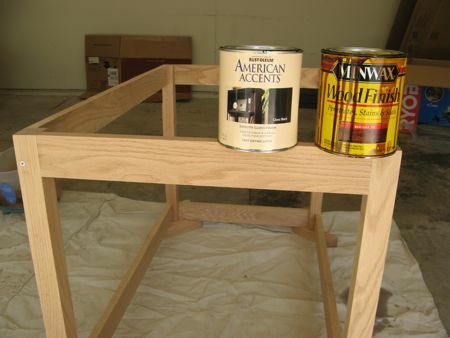 Ensure that the tabletop will sit flush on its supports. Screw the tabletop onto the support plates.